Wolcott – Maryann E. (Klobedanz) Gardner, 78, passed away peacefully on Wednesday, August 29, 2018. She was the loving wife of David J. Gardner, Sr., for 56 years. Besides her husband, David Sr., of Wolcott, she is also survived by a son, David Jr., of Wolcott; two daughters, Christine Gardner, of Medford, MA; and Jacqueline Cosmos, and her husband, Christopher, of Wolcott. She was a devoted and loving grandmother to her two granddaughters, Kaitlyn Christine and Alisha Rose Cosmos. (Nana was so very special to them). She was born in Waterbury, on June 3, 1940 to her father Charles Klobedanz and her beloved mother, Christine (Sheehy) Klobedanz. She attended Bunker Hill Elementary school and graduated from Crosby High School in 1958. She also graduated from Post College and worked a short time before her marriage, at Investors Diversified Services in Waterbury. More notably she worked at Martin’s Drug Store in Waterbury for 25 years from 1981 to 2006. Also known to be the “white haired lady,” who used to walk her 3 miles most mornings in the Garrigus Court, Central Ave. neighborhoods during the 80’s and 90’s. 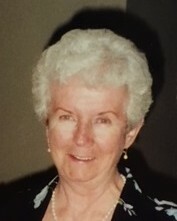 She attended St. Pius Church in Wolcott for over 50 years and belonged to the Farmingbury Women’s Club for many years, and was a midget football cheerleading coach for the Raider team in the 1970’s. Maryann was also active with baseball in Wolcott in the years that her children and husband played and coached there. With baseball during those years, so important to her family life, we can’t help but remember the Snack Bar at the old Boy’s League Field on Woodtick Road, where she tirelessly volunteered during the 70’s and 80’s and met and became close to so many new friends. Also during that period, she was very active with the Girl Scout Troop that her two daughters were members. She was also one of the original members of the Drifters Bowling League where she bowled and was treasurer for 32 years. In her later years, she was always loyal to the girls’ softball and basketball programs in Wolcott, where her granddaughter played. Over the years, she was a fixture and hardly ever missed a game whenever her granddaughters and her own children were playing that day. Presently, until the time of her illness, Maryann was very active with her Crosby 1958 reunion committee who are planning a 60th reunion at the present time. Besides her husband, children, and grandchildren, she is also survived by many cousins, aunts, nieces and nephews. She was predeceased by her very special lifetime friend, Joann (Dillon) Meier, of Southington, and her very special German Shepard “Bear.” Maryann and her husband had many friends from their early years, who they saw regularly by going out to dinner on weekends. They were also known to travel on their big trips often with their “traveling” good friends the Muellers. Maryann was also an avid sports fan. Besides being there when her kids and grandkids played, she would hardly ever miss a New England Patriots or a Boston Red Sox game. She also was a great fan of UConn basketball, of course, especially the women’s teams over the years. Win or lose, she took pride in “her” teams, like they belonged to her. Calling hours will be held on Tuesday, September 4 from 5 to 8 p.m. at Woodtick Memorial, 420 Woodtick Road, Wolcott. A Funeral Mass will be held on Wednesday at 10 a.m. at St. Pius X Church, 525 Woodtick Road, Wolcott. Please meet directly at church. Burial will follow in Woodtick Cemetery.